It's gearing up for another presidential election, and it's time to start noticing all of those small, insignificant details that creep up on everyone's memory--remember George Bush Sr's amazement of a checkout scanner, or the subliminal rats in GOP ads?--which may or may not be true, but will forever stick with a public figure regardless. We're starting early this time, and this time we're going to gaze deeply into Michele Bachmann's crazy eyes. Look deep into my hypnotic eyes. You will stop smoking, lose weight, and vote for the balanced budget amendment. Many outlets--including some surprisingly liberal ones--are calling the cover in poor taste. It may be that it's a deliberately unflattering picture, or that it's sexist, or that it's unnecessarily provocative (although "The Queen of Rage" was obviously done on purpose). And since Newsweek has been known to poke the bear on occasion--see Sarah Palin's (again) sexist cover from a few years ago, or the digitally-aged Princess Diana at her son's wedding, which to be fair is not sexist but certainly is creeeeepy. 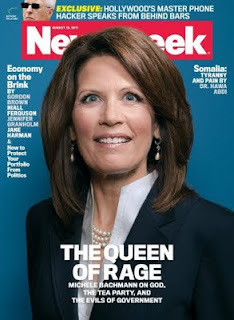 All that said--I'll be honest, I don't see the big deal with the Bachmann photo. I mean, I get that she looks slightly wild-eyed, but nothing particularly alarming. Given the state of her smile--or half-smile--it seems apparent that this was not a posed picture, and that the profile was therefore selected specifically because it was unflattering. But I don't think it's as unfair (for conservatives) or sexist (for liberals, killing themselves over defending Ms. Bachmann) as anyone really believes. Any thoughts? Is this an apparent attempt to paint the representative from Minnesota as a wild-eyed crackpot? Or just a standard unflattering photo? Or is everyone just reading too much into it?